Replacing parts for the Samsung Galaxy Note 2 but not at Phone Ninja. We replace all parts with high quality replacements for much lower rates than our competitors all backed by our Perth price-beat guarantee. We can even fix most problems on the spot! If you have broken or smashed the glass of your screen but your screen is still working fine, then there is nothing to worry about as we can replace just the glass for a discounted price. 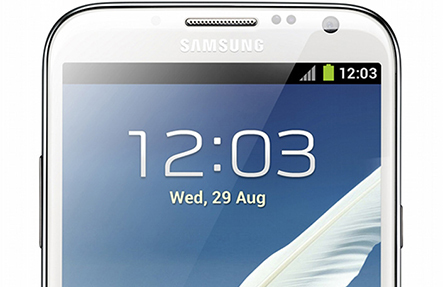 Using a process called refusing we can replace the top glass of the Samsung Galaxy Note 2 without replacing the whole screen. But if you have broken the LCD or the touch doesn’t respond then the whole screen needs to be replaced along with the frame. We of course repair many other Galaxy Note 2 problems from our stores in Perth Western Australia – just bring your phone in and have it repaired in most cases on the spot. *Until Stock Runs Out! ** Your screen will be traded in for a replacement unit.